When I initially started my garden boxes in our home in Connecticut, I had dreams of my husband dumping fertilizer and our two teenage sons helping me plant veggies. Well, as it turns out my husband did help with the fertilizer but that’s kind of the extent of it. My oldest son Danny is off to college and Christian is way too busy with cross country and track to even consider any of mom’s “hobbies”. Yet, with all the solitude that my gardening brings I have managed to find a true companion that never abandons me for greener pastures. Teddy is our chocolate lab – pictured in the header of this page. He may not understand why I’m in the veggie box aggressively ripping at weed but he undoubtedly has become my best friend in my little corner of paradise. Not only does possess a unique curiosity for that smelly lobster compost but he has become adept at the art of keeping pesky deer away. And for that, (and his companionship) I am eternally grateful. 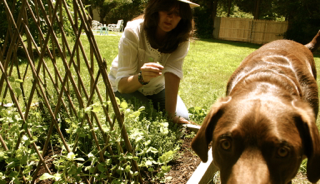 This entry was posted in Garden, Herbs, Pets and tagged chocolate lab, compost, teddy. Bookmark the permalink. Thanks Rachel. Love that dog of yours! Simply adorable.